September 1 Sugarland Rally, with U.S. Sugar Corporation refinery as a backdrop. 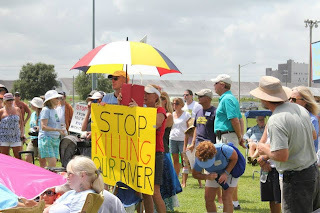 On September 1 Floridians from all over Florida, close to 500 of them, put their holiday plans on hold and converged upon Clewiston to join local residents to send a clear message to Tallahassee: they are sick and tired of sick water and they are ready to take action. 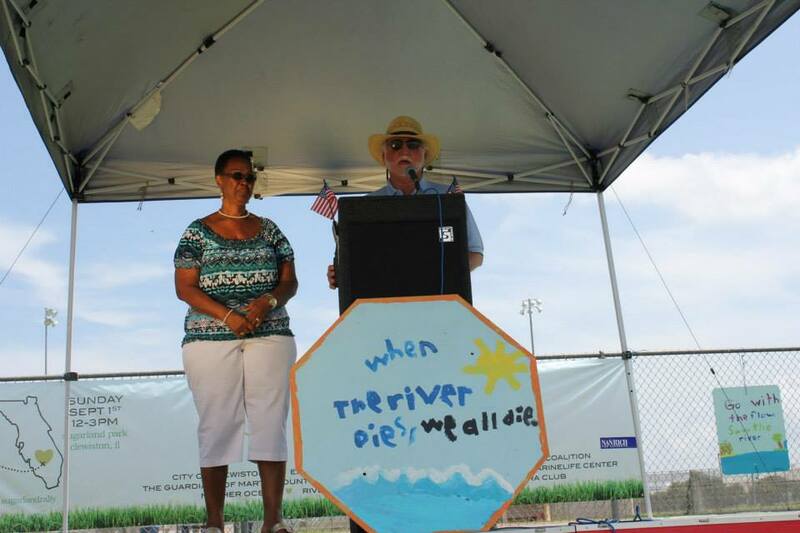 The rally marked the beginning of a movement to unite all Floridians who demand both immediate reprieve and long-term solutions to the pollution that plagues waterways from the Panhandle to Florida Bay – the sewage, manure and fertilizer that feeds toxic algae. People who live in the communities downstream of the Caloosahatchee and St. Lucie locks spoke of being fed up with being treated like the spillways for a cesspool, which happens whenever the impounded Lake Okeechobee reaches levels considered unsafe by the Army Corps of Engineers. They want Governor Scott to declare a state of emergency, citing the staggering environmental and economic losses and unknown recovery period if the destruction continues. The people who live and make their living south of Lake Okeechobee spoke eloquently about the threat of a failing dike and the flood waters it could send over their community, the fear of loss of jobs, and the need for a secure future. Among speakers from Clewiston were Mayor Phillip Roland, Clewiston High School science teacher Mike Kemp, high school student Cecilia Chairez and President of the Clewiston Chamber of Commerce Denise Hatton. But all, from every side, asked the same question: How long can Lake Okeechobee, the estuaries downstream to the east and west, the Everglades, the springs, the state’s imperiled lakes and rivers hang on while we wait for truly comprehensive plans and actions? And all, speakers and crowd, agreed on one thing: impacted citizens must join together as one. The Sugarland Rally brought these voices together as never before. Expedition Florida 500’s Justin Riney started the day off with: "The Sugarland Rally is a turning point. A message that emphasizes the strong sense of unity needed among the people, among Floridians. We must all come together to find sustainable solutions for our home. We must do it now." “This is the beginning of our movement to hold elected officials accountable for the future they seem so ready to sell to corporate polluters. East, west, north and south, our movement will grow, and bring sanity back to Tallahassee and restore the hope that our children will enjoy the swimmable, drinkable, fishable waters we knew as children. 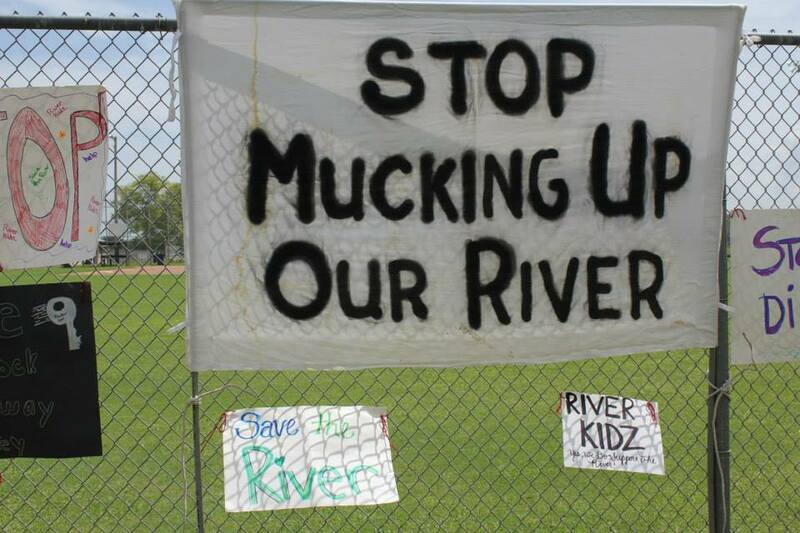 At the ballot box, we will demand clean water” stated Indian Riverkeeper Marty Baum. It is sewage, manure and fertilizer that brought us to the Sugarland Rally - we are all swimming in it. The state, the Governor, has refused to make Florida’s biggest polluters clean up their own messes and has instead given the polluters the job of making up their own pollution rules. That won't work for us and we can't stand for it to continue. We need clean water. We need to clean it upstream and then we need to move it south. In order to restore the Everglades we must move the water south. But together we CAN come up with a way to move it south that protects ALL of us. We need to start the process of drafting a Citizen’s Solution to the problem. We must hang together and not let “the powers that be” divide us. A petition calling for the Governor to: “Clean the water. Move it south. Restore the Everglades. Protect the People. Now” was passed among the throngs and will be used to send that message to the governor until he acts accordingly. See petition here – print it out and help us get the message to Tallahassee. Handmade signs ringed the gathering.